It seems that in the waning months of 2016 just about every manufacturer released a simple, non-adjustable device. Some are stand alone mods, others are all-in-one devices and others are kits that included both a tank and mod. A few are powered by external batteries and many include internal batteries. Kangertech brought a number of products in this category to market. The latest is the K-Kiss Kit, featuring the K-Kiss mod and K-Kiss tank. They sent one to Seven Report for review. There is only one button on the K-Kiss mod, the fire button. Push it five times to turn the mod on or off. The LED on top of the device will flash to let you know if it’s on or off. The display is made up of five small LEDs which serve as a battery life indicator. The display will illuminate when you press the fire button. The LED also serves indicate a variety of warnings. The K-Kiss will fire coils with a resistance of 0.15 ohm or greater. The manual states that the output of the mod is “full power output,” which, according to my source at Kangertech is about 60 watts. There is no power or temperature adjustment on the K-Kiss. Kangertech equipped the K-Kiss mod with an internal 6300 mAh battery, which should provide loads of vape time. Charge the battery via the micro USB port located on the side of the mod using the included charging cable. 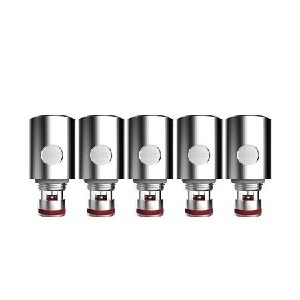 The tank is 4.5ml top filler and comes with a 0.2 ohm SSOCC, for Stainless Steel organic cotton coil, installed. To change the coil in the K-Kiss tank unscrew the air flow base from the rest of the tank and remove the old coil by unscrewing. Then simply screw in a new coil. Before vaping with a new coil be sure to prime it by dripping a few drops of ejuice into the center of the coil and putting a drop on each of the ejuice flow ports. Unscrew the top cover from the tank to fill it. Drip ejuice directly into the tank and then reattach the top tank. If you’re using a new coil, allow it to soak in the ejuice for several minutes to make sure it’s fully saturated. The tank also features what Kangertech refers to as a new symmetrical air flow design. Airflow is not adjustable on the K-Kiss tank. For a device that puts out a maximum of about 60 watts, the K-Kiss delivers a very impressive amount of vapor. And those SSOCC coils provide pure, clean flavor. Where the K-Kiss really stands out is that 6300 mAh internal battery. I’ve been regularly getting close to two full days of heavy vaping between charges. If there’s any area where the Kangertech K-Kiss Kit falls a little short, it’s in the features area. But that is mostly by design. This kit is supposed to by simple, uncomplicated and easy to use. And that it is. No wattage or temperature adjustment on the K-Kiss Mod and not even airflow adjustment on the K-Kiss tank may limit its appeal for some vapers. Kangertech did think to include some nice extras, like the micro USB charging cable, spare Pyrex tank and replacement O-rings. 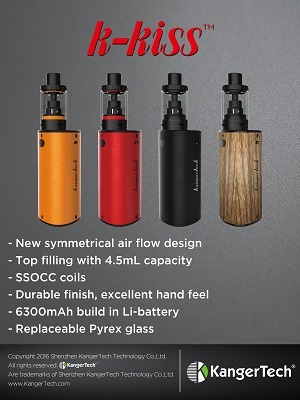 Kangertech has put out another high quality device in both components of the K-Kiss Kit. The mod is solid and the fire button powers it as soon as you hit it. And that 6300 mAh battery provides hours and hours of vape time. The K-Kiss Tank is likewise well built. The threading is smooth. And those SSOCC coils not only provide a generous amount of vapor and pure flavor, they last a good long time as well. The triangular shape of the K-Kiss not only adds to the looks, but makes it fit comfortably in your hand. The finish is deep and the color is rich. Kangertech offers the K-Kiss mod in orange, black, red, wood grain, a leopard print and python stripes. The tank comes in black. Kangertech has been a stickler for color coordination, and that holds true with the K-Kiss. The o-rings and charging cable are coordinated with the color of the mod (at least on the orange version I received). The Kangertech website has the list price of the K-Kiss Starter Kit at $65.90, but they have it available as a pre-order item right now for $52.72. Considering that this is a complete kit and it doesn’t require the additional purchase of an external battery, that’s a very competitive price. I’ve been using the K-Kiss for a couple of weeks with a variety of ejuices. I’m consistently impressed with purity of taste and output of the vapor. This kit would make an excellent starter kit for someone just getting into vaping or moving up from a more basic beginner kit. And it should satisfy most advanced vapers in need of a solid second set up. And with that long lasting battery it’s a natural to grab for a long road trip. 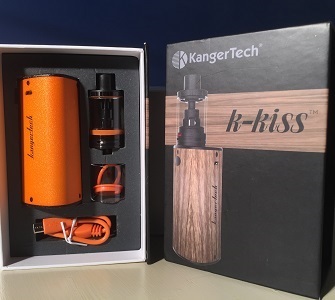 Kangertech provided the K-Kiss Starter Kit for the purpose of this review. 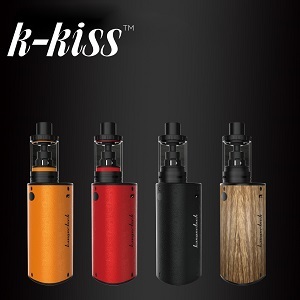 Order the K-Kiss Starter Kit from Kangertech.